Moisture resistant chipboard panels, suitable for furniture applications and wall partitions where exposure to moisture is possible. 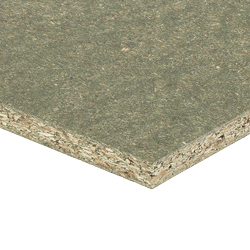 Similar to Furniture Grade Chipboard, P3 Moisture Resistant Chipboard is easy to cut, saw and generally machine but has the added attribute of moisture resistance thanks to its glue bond. As a result, expansion and swelling when exposed to humidity is kept minimal, making it ideal for applications in bathrooms and kitchens where humidity can fluctuate but quality and performance must remain stable. Commonly dyed green to signify moisture resistant properties. Hanson Plywood sources its collection of P3 Moisture Reistant Chipboard Panels from PEFC™ Certified forest concessions. The company’s robust Chain of Custody management system ensures that these certifications are respected and adhered to throughout the supply chain. For further information, please refer to our Environment Page. 18mm 2440mm x 1220mm is available ex-stock, however other sizes are available to special order (see below).